Land Rover are launching a £140,000 long wheelbase version of their Range Rover, as well as an exclusive new specification, the Autobiography Black. The new 5.0litre supercharged V8 variant – the first long wheelbase Range Rover for 20years – will make its debut at the LA and Guangzhou motor shows. Meanwhile, the range-topping Autobiography Black derivative will be available exclusively on the model, which boasts a 0-60mph of 5.5seconds and a top speed of 140mph. Billed as ‘the pinnacle of desirability’, it will debut at the Dubai International Motor Show. First customer deliveries of the Range Rover long wheelbase will be from March 2014, with Autobiography Black deliveries commencing in August. Phil Popham, Group Marketing Director at Jaguar Land Rover, said: “With the addition of the Range Rover long wheelbase to our portfolio of luxury SUVs, customers can now choose a vehicle that offers superior levels of interior space and comfort to compete in a market dominated by saloon cars up until this point. “The Range Rover Autobiography Black is our most luxurious specification yet. “It epitomises sophisticated design with immaculate attention to detail. The long wheelbase Range Rover boasts an additional 140mm of rear legroom, with the second-row executive-style seats reclining to 17 degrees. It is also equipped with powered side door blinds and a panoramic sunroof, as well as increased stowage. The long wheelbase will be offered on Autobiography and Autobiography Black models. 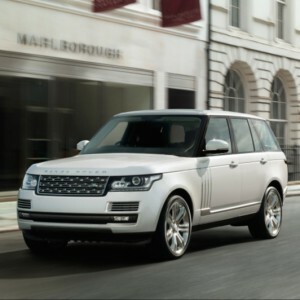 A Range Rover Hybrid derivative will also become available later in 2014. Meanwhile, numerous changes to the Autobiography Black exterior give it a ‘distinctive and subtly different character’. Gerry McGovern, Design Director and Chief Creative Officer at Land Rover, said: “The Range Rover Autobiography Black is the latest step in our transformational journey that moves luxury to another level. “This vehicle is an intensely design focused response to our customers’ desire for more choice and exclusivity. “The highest standards of precision detailing, together with the use of the finest crafted materials, have been achieved inside and out.